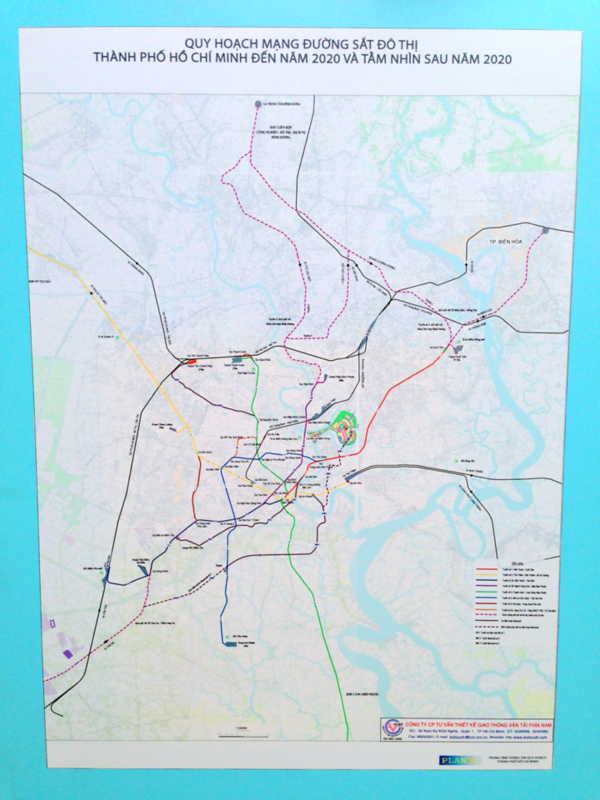 In 2012 Ho Chi Minh City began the first of nine planned transit lines (6 metro, 2 monorail, and 1 light rail). Line 1 is under construction, with Line 2 having briefly started before it stalled. The other lines are so far off from starting that there is no official metro map, so I made one with what information is available to the public. While I was making the map and plotting out stations on a Google Map, I started seeing gaping holes in the map of where a metro system would be useful. 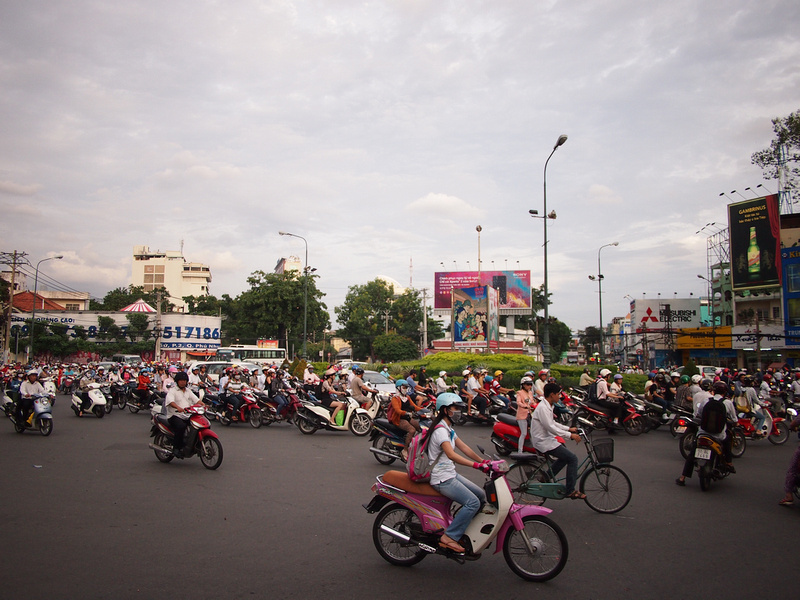 Being based in Saigon and documenting the new urban areas, I’m familiar with the main roads, the places with heavy traffic congestion, and where a metro system will be needed in the future. 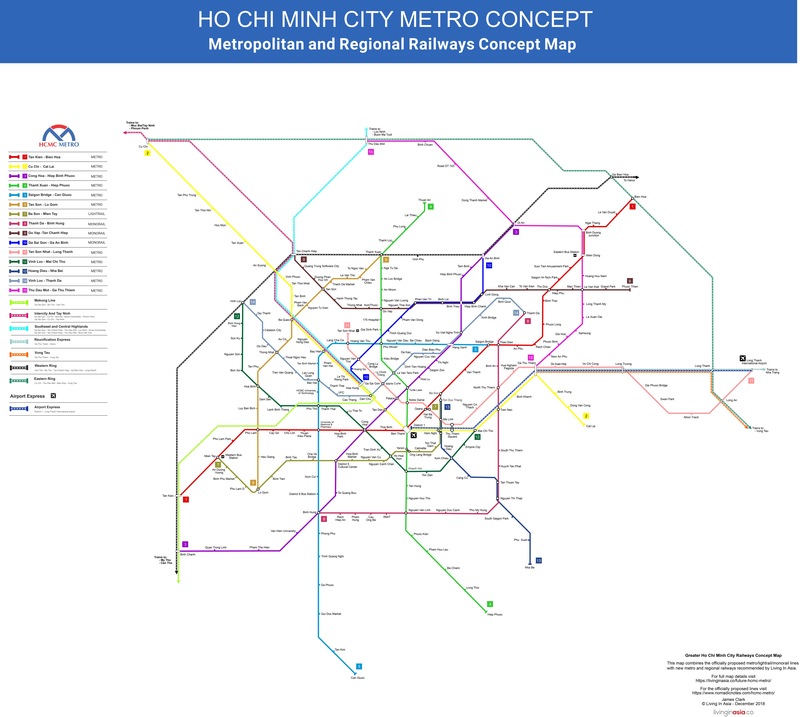 Here is my vision of an expanded Greater Ho Chi Minh City Metro. 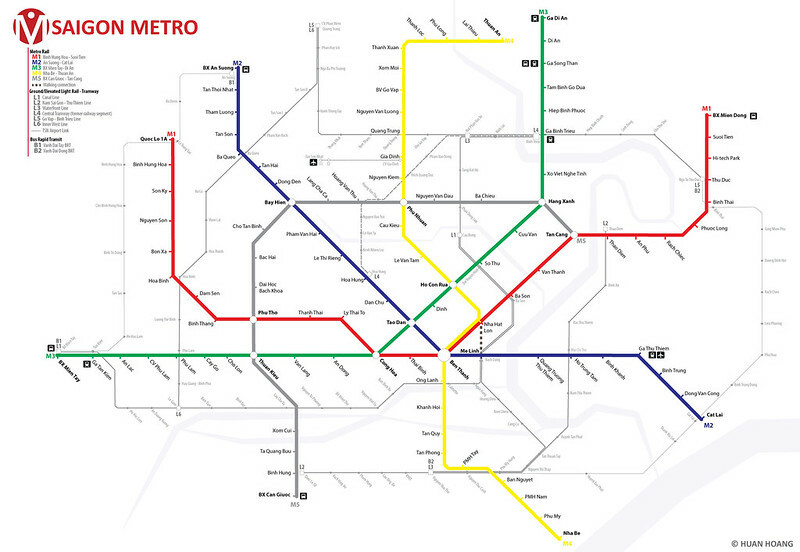 This map combines every officially proposed metro and overland rail line, with new metro and regional lines that would make a better metro service in the future. The current proposed metro system was planned with a population forecast of 10 million for 2025, but in 2017 it was revealed that the population was already around 13 million. The system will certainly need to be expanded beyond 9 lines in the future, so these are my recommendations. This map draws inspiration from the mega cities of East Asia, where populations are already closer to 20 million and have appropriate metro systems handle large populations. I used Shanghai in the heading as there are similarities between Saigon and Shanghai. 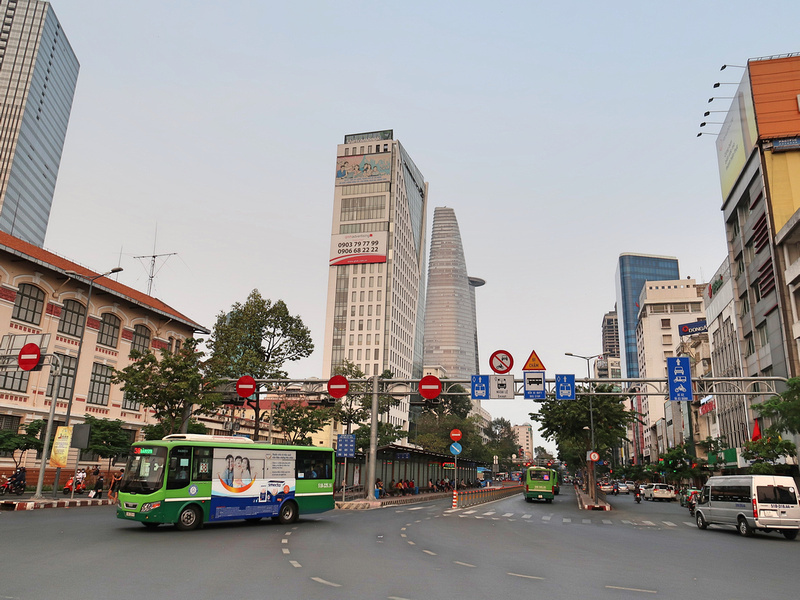 Apart from both once being the “pearl of the orient”, Saigon has a new urban area (Thu Thiem) that is similar in geography to the Pudong new urban area in Shanghai. 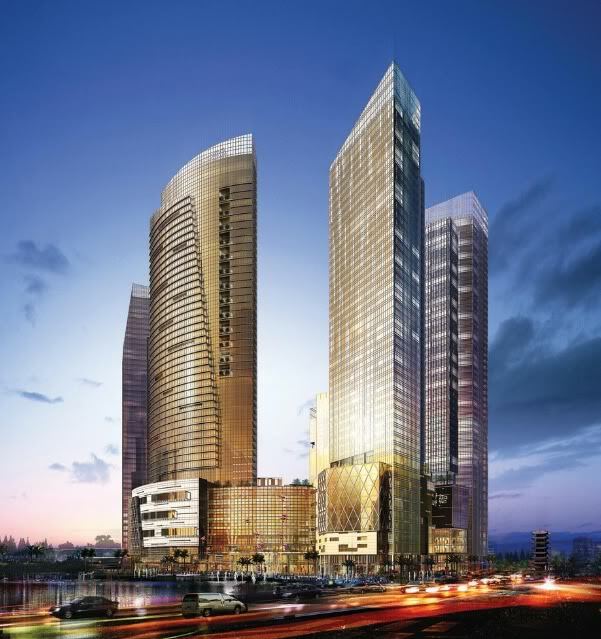 Saigon will also eventually have two airports like Shanghai, and they are both the financial capitals of their respective countries. The first 9 lines listed are what have already been officially proposed. There are some discrepancies over stations as not all of proposed lines have detailed plans yet, but I’ve put together the best presentation. The official lines are renumbered for clarity, so the first 9 lines on this map aren’t the same numbers on the official map. The current Line 3A will be part of Line 1, and the monorail and light rail are numbered with the metro lines. I’ve also added some extensions to existing proposals, and those additions are listed below. This map also includes commuter/regional railways overlaid onto the metro system. Most of these lines have been proposed before, and I’ve made a note on each line of my recommendations. This map uses the standard metro mapping style of lines at 45 degree angles, and as such is not to scale. You can see a more geographically accurate representation on this Google map. Below I have outlined the details of each line. It’s a long guide so it will be easier if you open the full resolution map to refer to as you read. 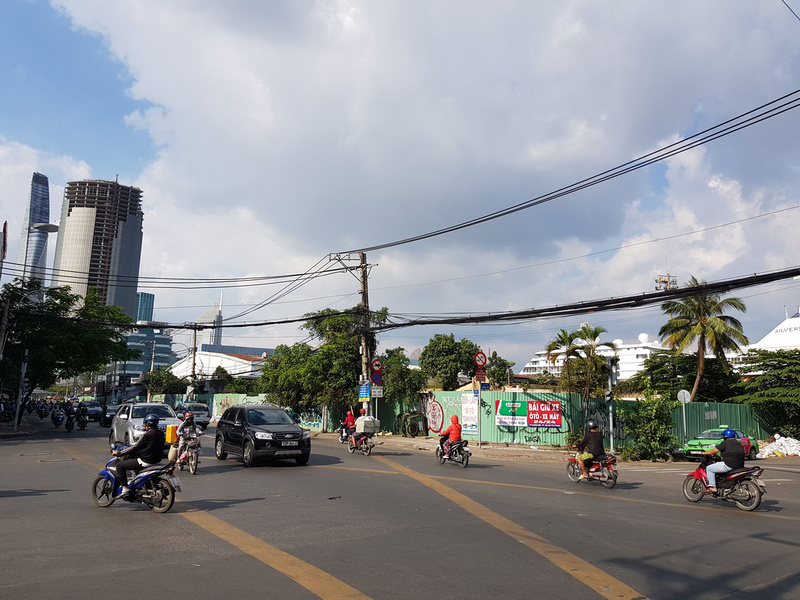 If you are living in Ho Chi Minh City then Line 1 will need no introduction, as the construction site at Ben Thanh Market is a continual reminder. Line 1 on this concept map has incorporated the proposed Line 3A, which will be the same line. At the northeast end, the line is extended from Mien Dong to Bien Hoa. This has already been proposed as a possible extension, so I’ve not made any other changes to Line 1. Line 2 is the second line that will pass through the Ben Thanh Central Station. There have been proposals to extend it northwest from An Suong to Cu Chi, and further into District 2 from Thu Thiem to Cat Lai. The Cu Chi extension a good idea considering how much traffic is on the road to Cu Chi. As that extension already makes it a long line for a metro service I’ve not made any changes. 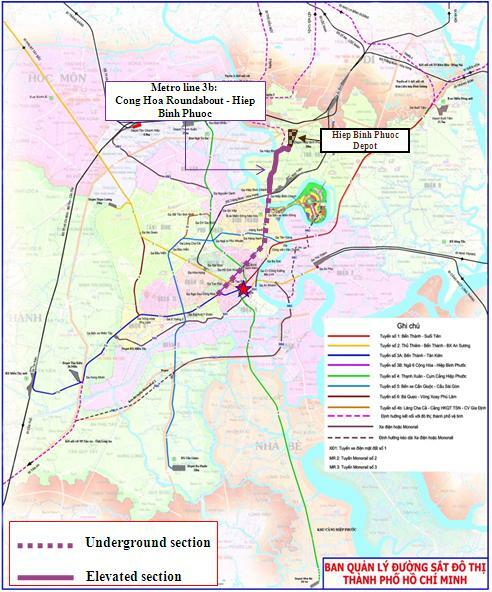 Line 3 includes the proposed Line 3B, from Cong Hoa Roundabout to Hiep Binh Phuoc. 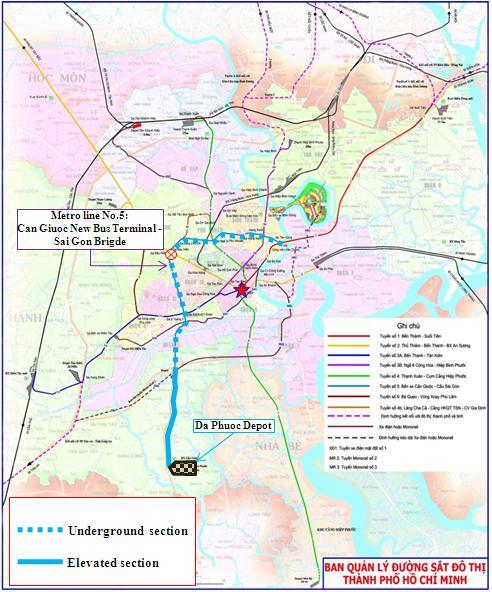 There is also a plan to extend the line to Di An in Binh Duơng Province, so that is also represented. Instead of terminating this line at the busy inner city roundabout of Cong Hoa, I’ve extended this line southwest to Binh Chanh. There is another proposal to extend the monorail at Binh Hung here, but I think this would be a good alternative instead of having a terminal station in an inner district. 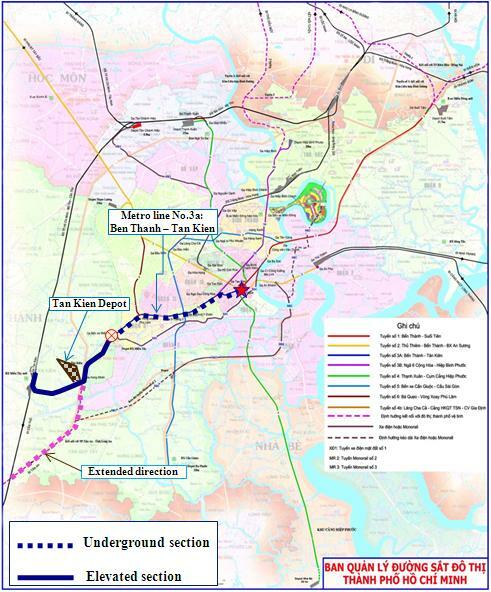 Binh Chanh is touted as a station for the future railway to the Mekong Delta, so it would be logical to connect the overland railway network into the metro system. Line 4 makes up the third line that intersects Ben Thanh Central Station, forming a north-south corridor from Thanh Xuan to Hiep Phuoc. For the concept map the line is extended north to Thuan An. Line 5 runs from the Tan Cang at Saigon Bridge to Can Giuoc, and it remains the same on the concept map. On the officially proposed metro map, line 6 is a connector line that sweeps through the western suburbs, feeding passengers to Lines 2 and 3A. The concept map extends this line at either end to make it an outer western ring line, connecting more lines and offering more places to transfer. Line 7 is the proposed Tramway 1 that I have renumbered for ease of use on the map. It remains almost unchanged to what has been proposed, with the bulk of the line running along Vo Van Kiet. This was one of the earliest proposals, with one report from 2006 saying that it will be ready by the end of 2009 if everything goes according to plan. 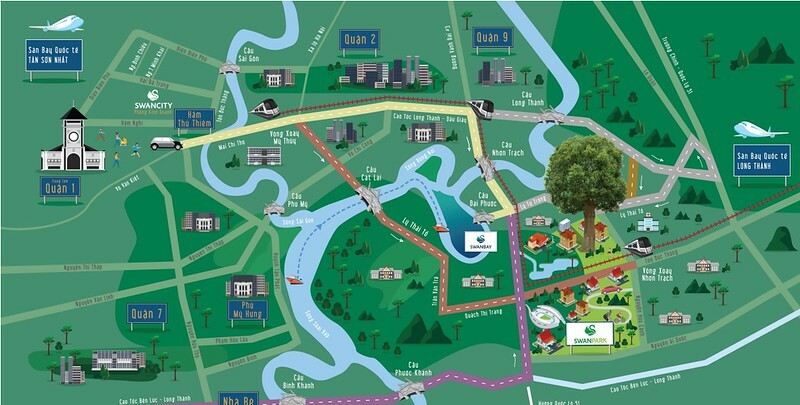 There are maps showing it run along Ton Duc Thang on the D1 riverfront, though this maybe impractical now if the plan to put the traffic in a tunnel goes ahead. Line 8 is Monorail 2 on the MAUR proposed map, so like the lightrail I’ve given it a number and integrated it into the overall system. The general route is the same as what is shown on the MAUR map, though the alignment and stations names will most likely be different. I also can’t see a monorail being pushed through Thao Dien to Thanh Da, but I’m just using what is on the old map. Line 9 is the second planned monorail line that would feed the northwestern districts to Line 4. 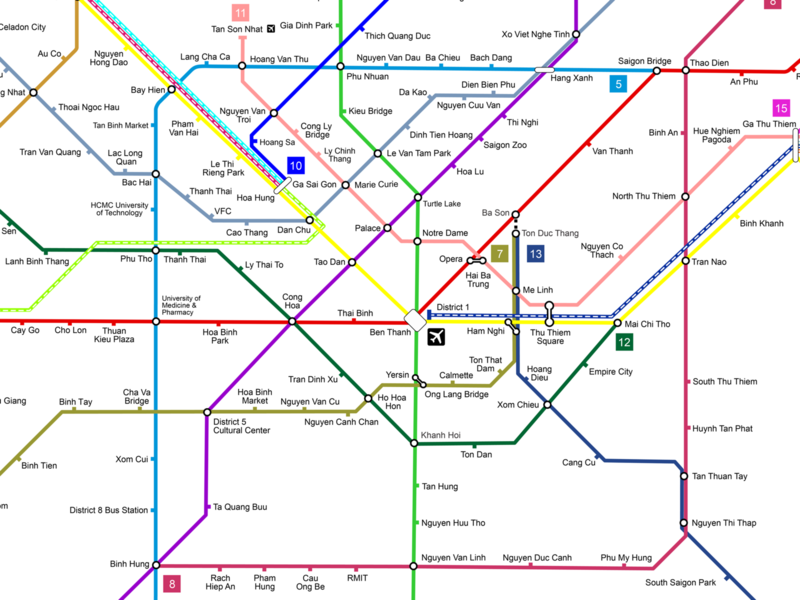 Rather than having it end at Line 4, the line is extended further into East Ho Chi Minh City. There are some big developments that are currently under construction, yet there are no plans for a metro. I’ve pushed this line into the furthest reaches of District 9 to the Dong Nai River. One of the station names is Grand Park, where the Vincity Grand Park is currently under construction. 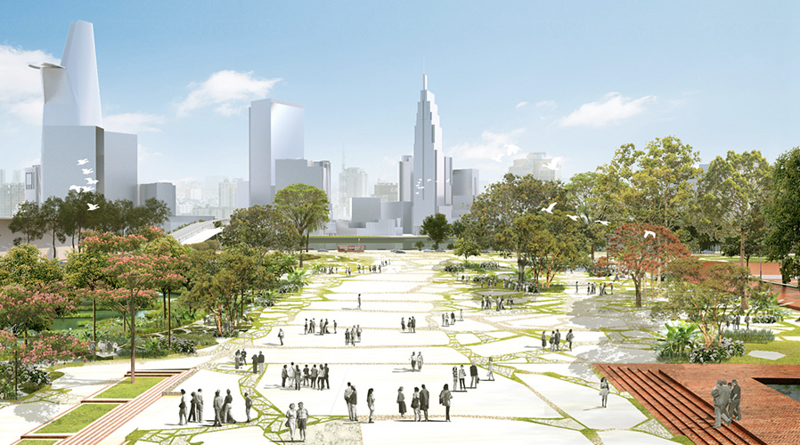 This is being promoted as being built on a “civilized and modern urban model of Singapore”. 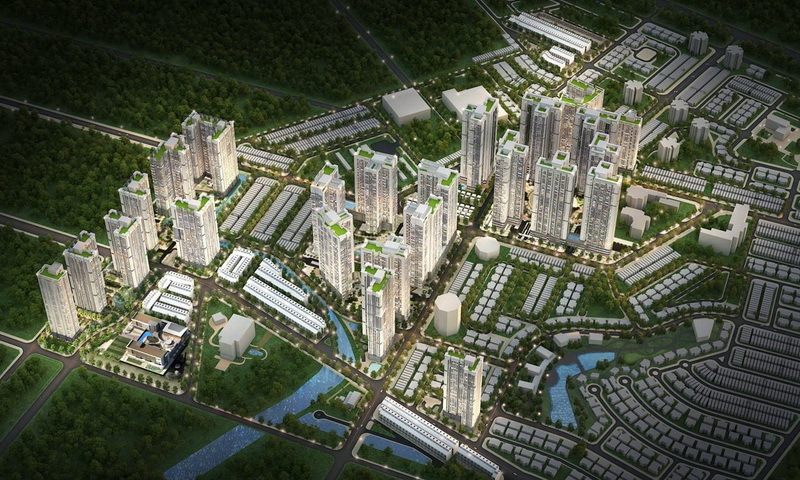 It seems futile to model urban developments on Singapore without including a metro. Line 10 begins the first of the proposed lines beyond what has already been planned. There have already been some suggestions for this line so I’m building on top of those. Line 10 runs along the current ground-level single-track national railway. The eventual plan is to move the railway to Thu Thiem, but there have also been plans floating around to keep the line and put an elevated railway here. One thing is for sure is that the current railway as it stands has to go. The railway passes though several road crossings, creating traffic delays every time a train goes through. 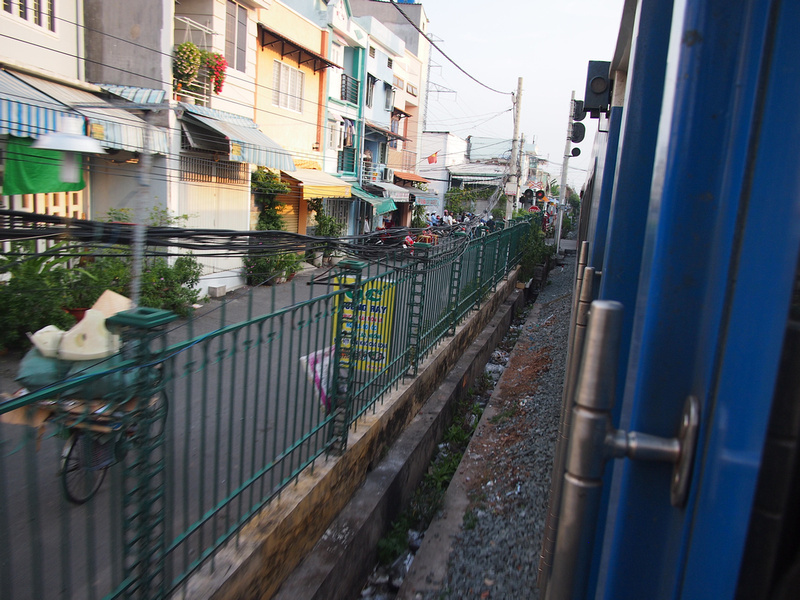 A city the size of Ho Chi Minh City should not have railroad grade crossings. If they were to keep the railway here it would have to be elevated, and it would need to be double-tracked. The current space would be a tight fit for a standard gauge railway, especially if it’s planning to be a fast train. The narrow passage would rule out running the national railway through here, but you could fit an elevated dual track monorail line along this path instead. A monorail like the Haneda Airport line or in Osaka is a good example of a monorail service along here. Note on the map that Line 9 shares the line with Line 10, so it would need some Japanese-level switching at the junctions. Line 11 is my airport-to-airport line, as inspired by Line 2 of the Shanghai Metro. 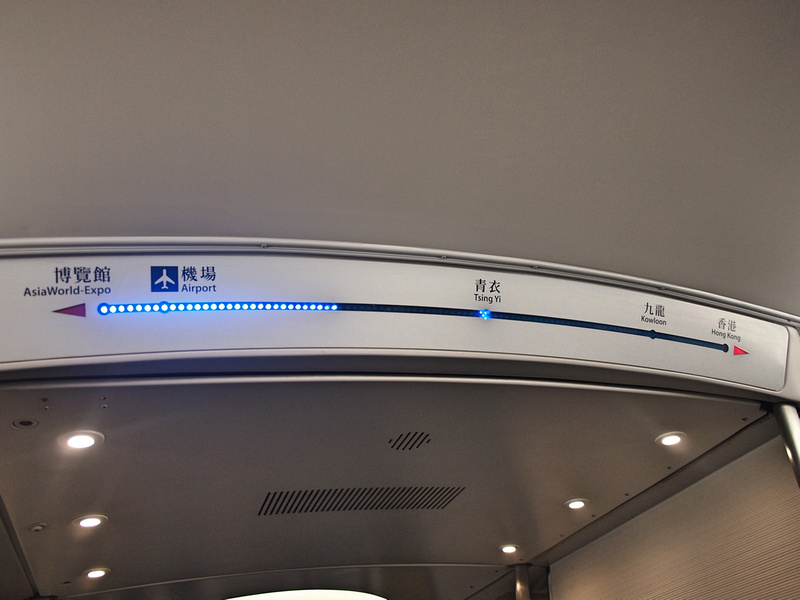 Line 2 connects the two airports of Shanghai (Hongqiao and Pudong) via the People’s Square and popular tourist area of Nanjing Road. 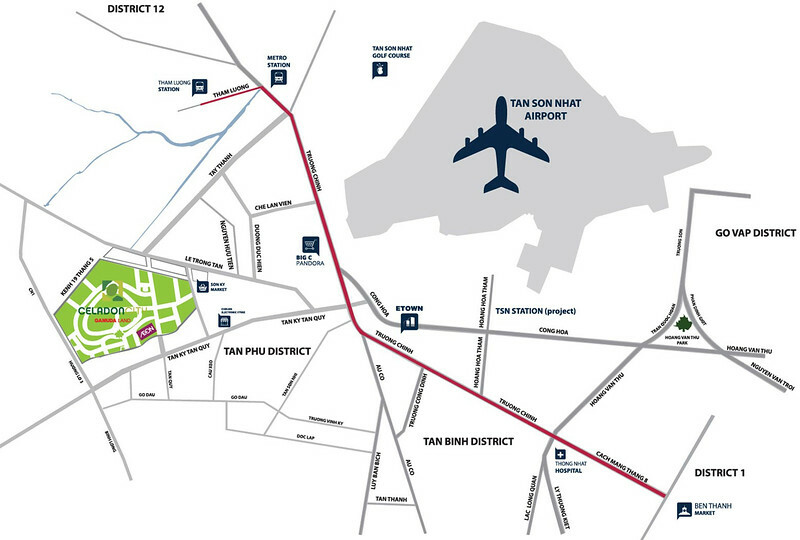 Line 11 would connect Tan Son Nhat International Airport to the proposed Long Thanh International Airport. This may seem overly ambitious, but elements of it have already been proposed in one form or another. 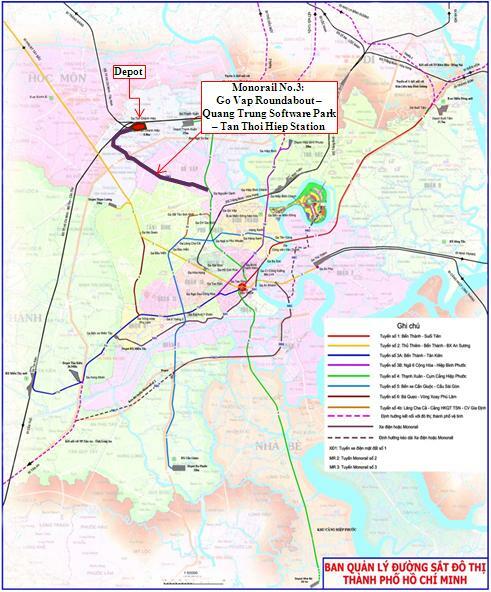 Starting at Tan Son Nhat, an extension has already been proposed from Hoang Van Thu (Line 4B1 on the original map). From Hoang Van Thu the line would then go towards the city along Nguyen Van Troi and Nam Ky Khoi Nghia. 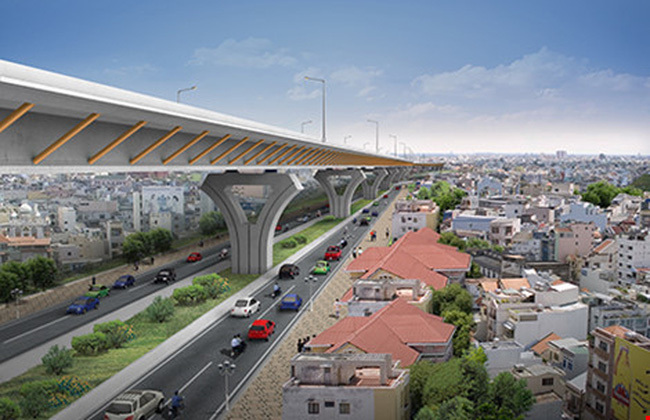 Instead of building an elevated overpass from the airport, build an elevated railway along Nguyen Van Troi and the wide section of Nam Ky Khoi Nghia. Nam Ky Khoi Nghia is already becoming built up with more towers, so this section is going to need a metro eventually. An elevated metro line along here would resemble Sukhumvit Road in Bangkok, though underground would be better. If it is above ground, when the metro approaches Vo Thi Sau it would go underground, one line at a time. This line would connect the landmarks of the city, and add more capacity to District 1. From there the line goes under the river to District 2. Keeping with the Shanghai Line 2 theme where that line passes through the People’s Square, Line 11 stops at the future Thu Thiem Square. From Thu Thiem Square the line follows the path of Luong Dinh Cua. The area along this road is rapidly developing, and at the station Hue Nghiem Pagoda is site of the Raemian Galaxy City project. There are numerous developments in District 2 like this that will need access to public transport. The line continues to the new central station, Ga Thu Thiem. 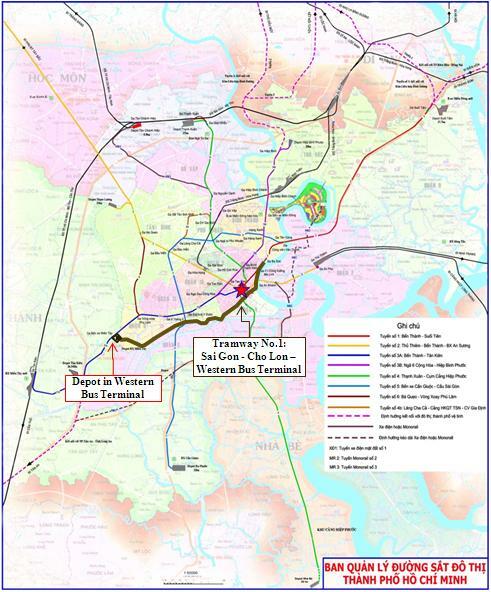 There is already a railway planned from Thu Thiem to Long Thanh International Airport, but there is also a proposal to extend the metro to the new airport that hasn’t been published on the metro authority website. I first became aware of the metro extension to the new airport from a property development website. 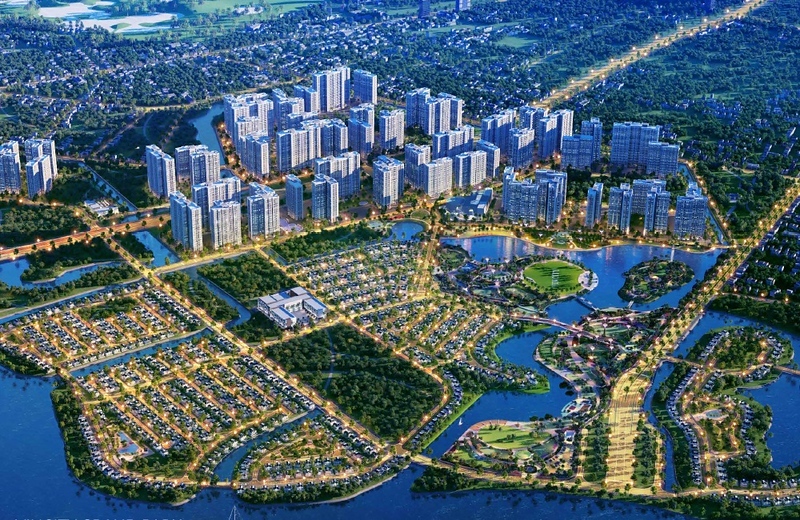 The Swan Park new city development in Dong Nai Province is between District 2 and the new airport. 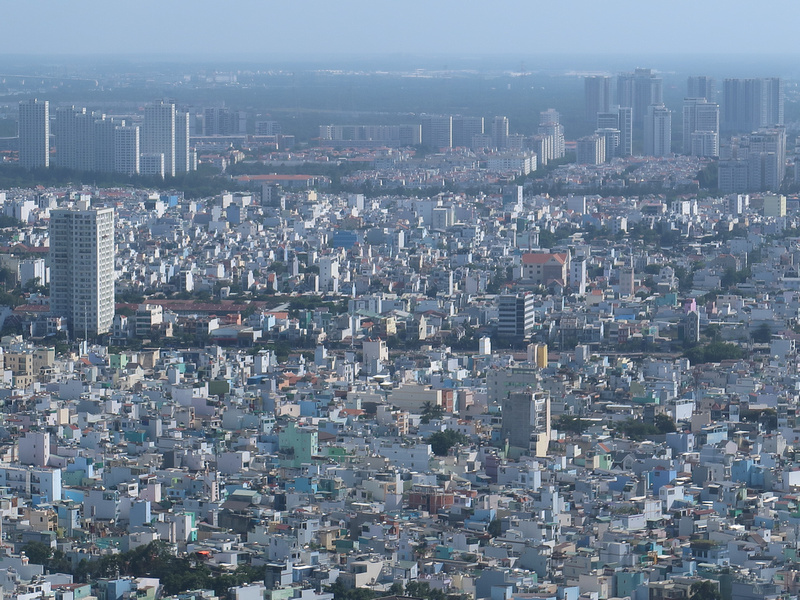 The sales brochures advertise it as “East Saigon”, though it’s not even in the 24 districts that make up Ho Chi Minh City so it’s more “East of Saigon”. 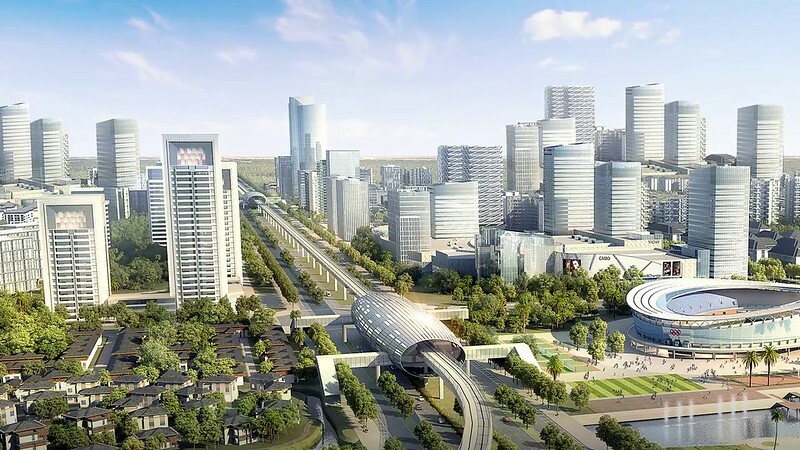 Marketing images show a metro line going through this new city area. 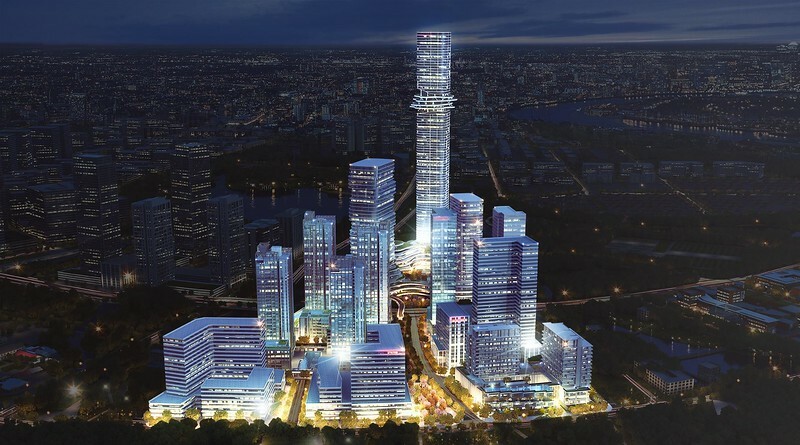 If new cities are going to be built in the Greater Ho Chi Minh City area, this is what it should look like. This appears to be a separate railway from the national railway that would connect Saigon to Hanoi via the new airport. With a another metro service of some sorts already planned from Thu Thiem to the new airport, this could be part of an airport-to-airport line. Line 12 is a cross-town metro line that provides an alternative for the western half of the city to get to the District 2 New Urban Area without going through District 1. It will also add some much-needed capacity to District 4, which so far only has one solitary metro station planned. The island of District 4 gets an overwhelming amount of traffic passing from D1 to D7, and looking at this new map I’m already thinking that it’s too conservative and there should be another north-south line through D4. Line 13 would be a riverfront line that runs along the D1 and D4 waterfront. I’ve added this by applying the rule that if you are going to build mega urban developments then it must include a provision for a metro transport system. 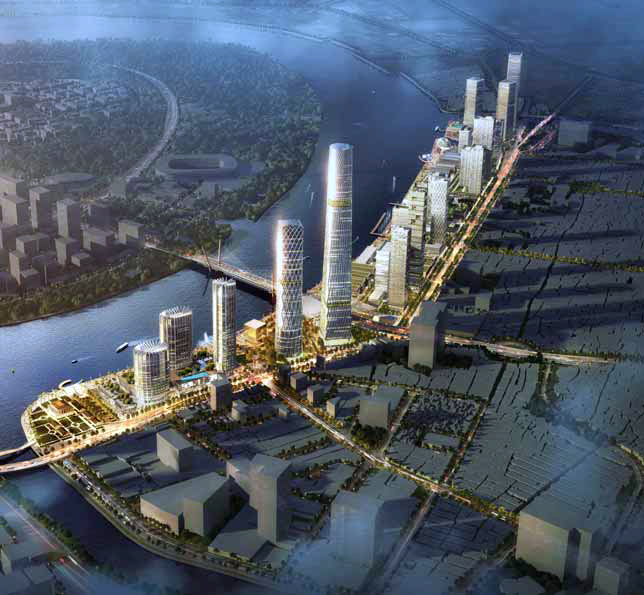 In the case of District 4 there is a plan to move the port and redevelop the entire Saigon River side of D4. There is no official plan as to what is going to be here, but already you can see parts of the riverfront being demolished in preparation for something. This line would then continue through to South Saigon in District 7 and onto Nha Be District, where there are more new housing developments without metro access. 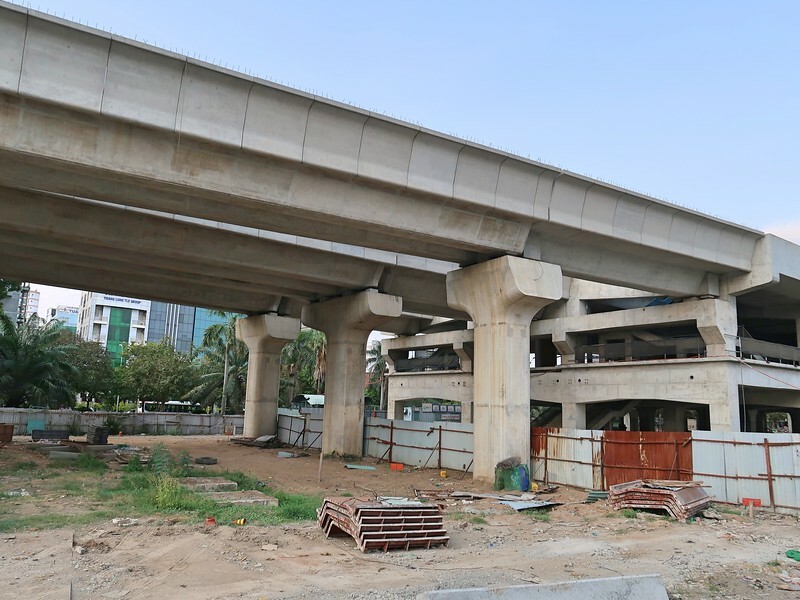 Line 14 connects some of the big future projects around the city along one of the most congested roads. Starting on the orbital national railway that circles the outer city, Line 14 goes though new urban development of Celadon City. VFC station is located at the now abandoned Vietnam Financial Centre project. It will probably become another housing development so a metro will be needed for whatever ends up here. 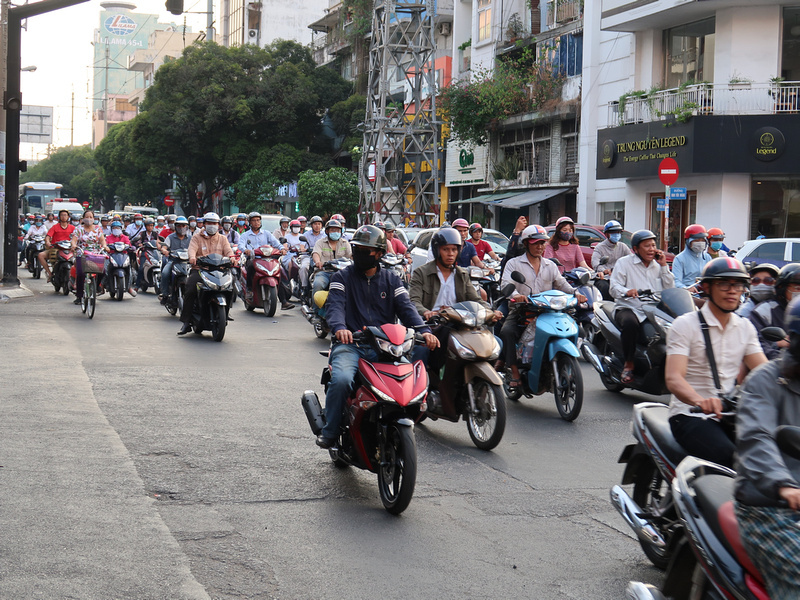 Travelling underneath the mayhem of the Dan Chu Roundabout, the metro then continues along Dien Bien Phu into Binh Thanh District. 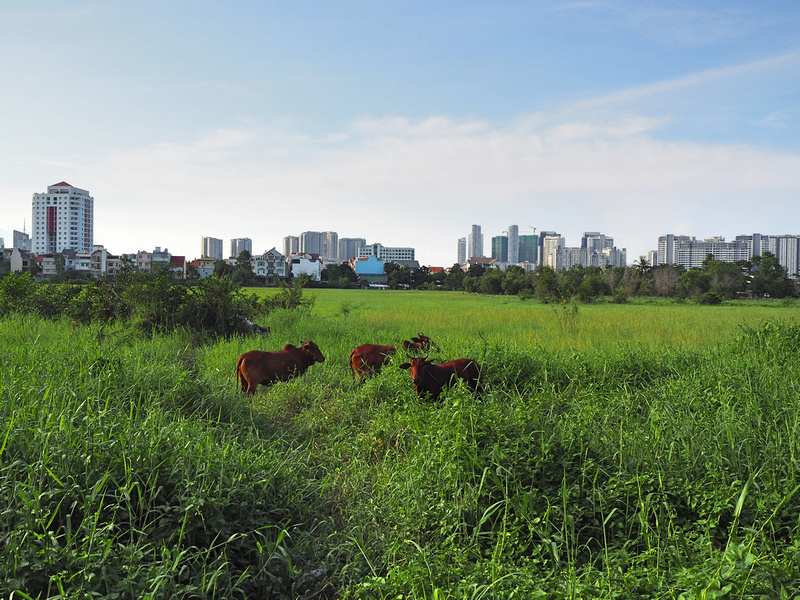 The line then goes to the Thanh Da peninsula, where a new urban development is planned. This original plan by Bitexco gives an idea of what it might look like. I think the peninsula would be better off being a park, and I’ve listed that as one of the ideas to improve Saigon. After decades of delays it looks like there are plans to revive the project, so there goes my park idea. In that case if a new city is going to be built here then it will need a metro. There is only one road going in and out, so it will be traffic chaos otherwise. 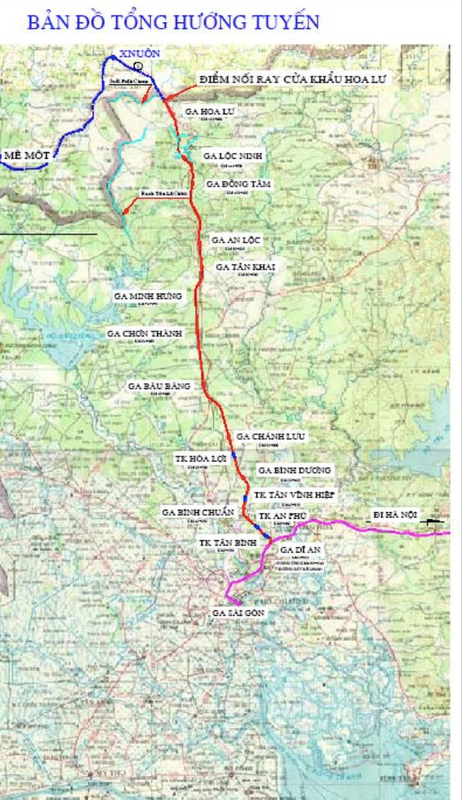 There are two proposals to extend Line 1 at the northern end to Di An Town in Binh Duong Province and Bien Hoa City in Dong Nai Province. Rather than making Line 1 fork into two branches, I’ve turned the Bien Hoa extension into a continuation of Line 1, and made a new line for the extension to Di An. There was also another report that had the extension going as far as Thu Dau Mot, so I’ve made that the start of Line 15. North of Thu Dau Mot is Binh Duong New City, but that could be covered by a commuter railway so I’ve left it out of the metro network. All new satellite cities should have regional railways included in the plan. Beginning at Thu Dau Mot, Line 15 junctions with Line 1 and then continues through District 9 to Thu Thiem Station in District 2. 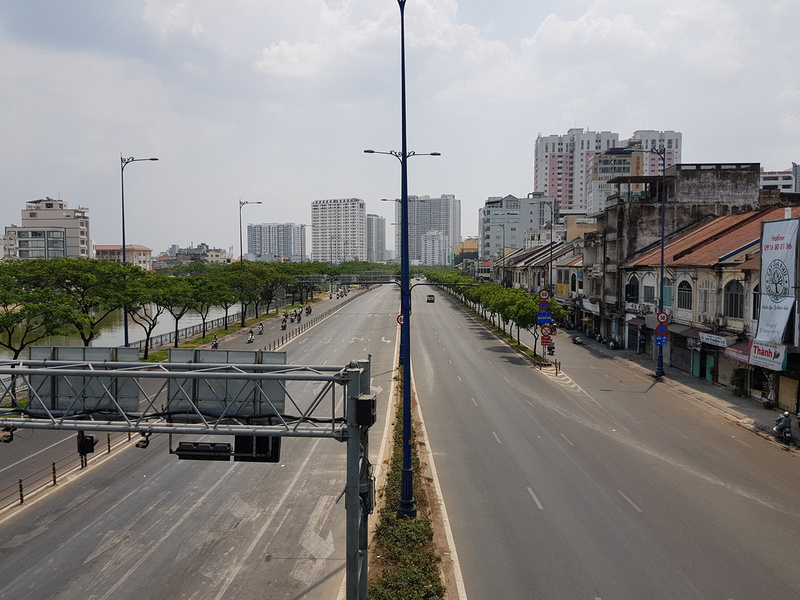 With so many building projects planned for District 2, Thu Thiem Station should be a bustling junction of East Ho Chi Minh City with multiple metro options. 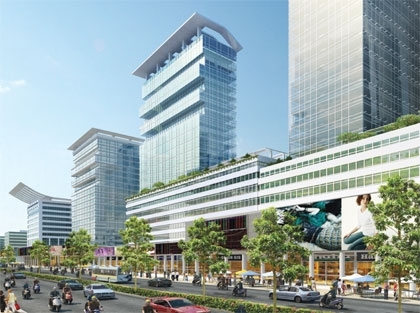 Districts 2, 9 and Thu Duc (East Ho Chi Minh City) has been touted as an innovation hub and “New Smart City”. Line 1 straddles the boundary of District 9, but apart from that there is no metro planned at all. It will hardly be innovative, smart, eco, or whatever buzzword you care to use if more metro services aren’t planned for the area. Note that one of the stations is Samsung, named for the enormous Samsung factory complex in District 9. Personally I prefer not to have metro stations named after businesses, but I’ve put this here for want of a better name. I’ve also placed it as an example of what the metro authority could do to raise money. For example Dubai have raised funding for their metro by allowing businesses to name stations. In addition to the metro lines this map also incorporates regional railways, as all good transport systems should do. For this map I’ve used dashed lines like London and Tokyo, as they are good examples of cities that integrate all forms of rail transit. To show where these lines go I’ve made a bonus map that shows regional railway routes of Southern Vietnam and services in Cambodia. Most of the lines on here have already been planned, so this map is not as radical as it looks. I’ve added some new lines to improve it, and I’ve given names to already proposed lines for the sake of identification on this map. Ga Sai Gon in the western half of the city to provide services to the Mekong Delta, Cambodia, and to the southeast provinces and Central Highlands. 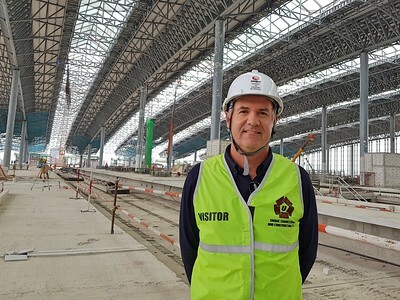 Ga Thu Thiem in East Ho Chi Minh City will service trains to Long Thanh Airport, Vung Tau, and will be the new home for the North-South railway. Both stations should be transit hubs that allow easy access to the rest of the city. They should also be architecturally iconic, as they will be the first experience of the city for new visitors. The Reunification Express is the current North-South railway that runs from Ha Noi to Sai Gon. 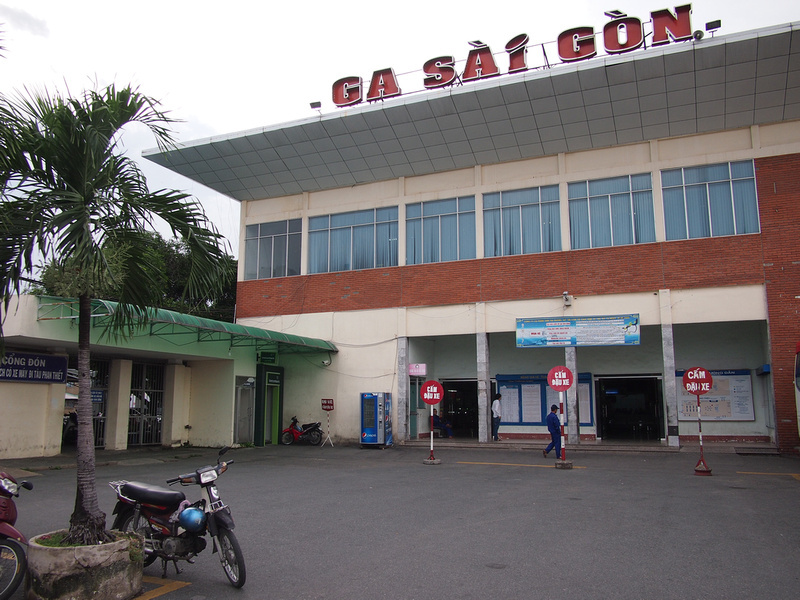 The eventual plan is to move the terminal station from Ga Sai Gon in District 3 to Thu Thiem in District 2. 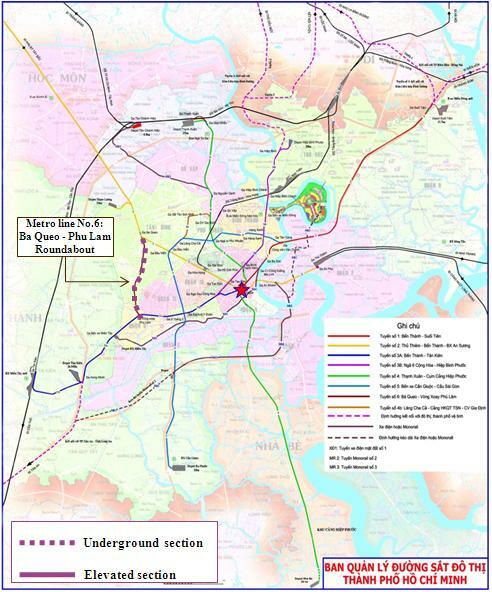 There has been a proposed railway to go around greater HCMC, forming an outer ring that bypasses the city. I’ve named it the Western Ring and turned it into a railway service to highlight how it would work in the grand scheme of things. As you can see on the regional map, this service starts in the Mekong Delta and ends at Long Khanh on the main north-south railway line. 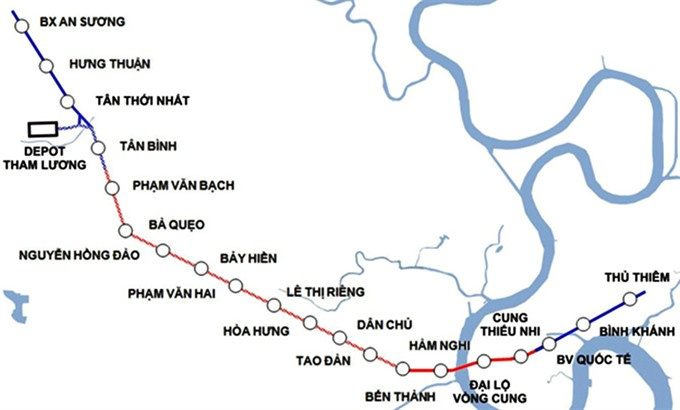 The Western Ring would serve as a bypass of the city, allowing passengers in the Mekong Delta and outer districts to travel north of Ho Chi Minh City without having to go through it. The stations along this line would also be the terminal stations for a number of metro lines. 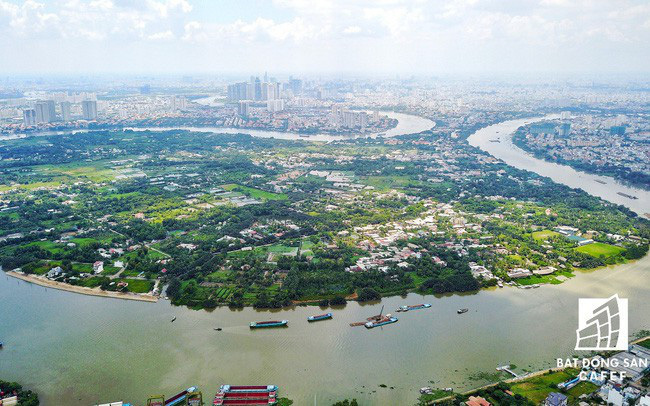 There have been numerous announcements over the years for a railway to the Mekong Delta, with the high-speed HCM City – Can Tho railway being the most recent. The latest reports have had the line going around the city on the alignment shown on the previously mentioned Western Ring line. One study has the HCMC terminus at Di An, which is not even in Ho Chi Minh City but in Binh Duong Province. 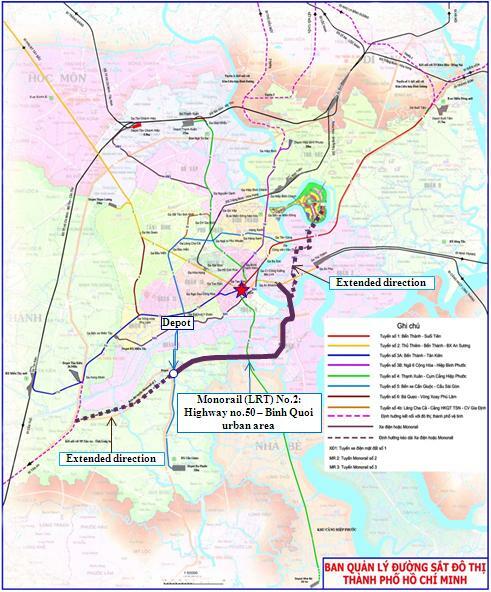 Another report shortens the route to have the line terminate in Binh Chanh District. That’s at least in Ho Chi Minh City, but it’s a long hike from there to District 1. It would defeat the purpose of building a high-speed railway, only to dump passengers at the outer extremities of the city to get a metro the rest of the way. 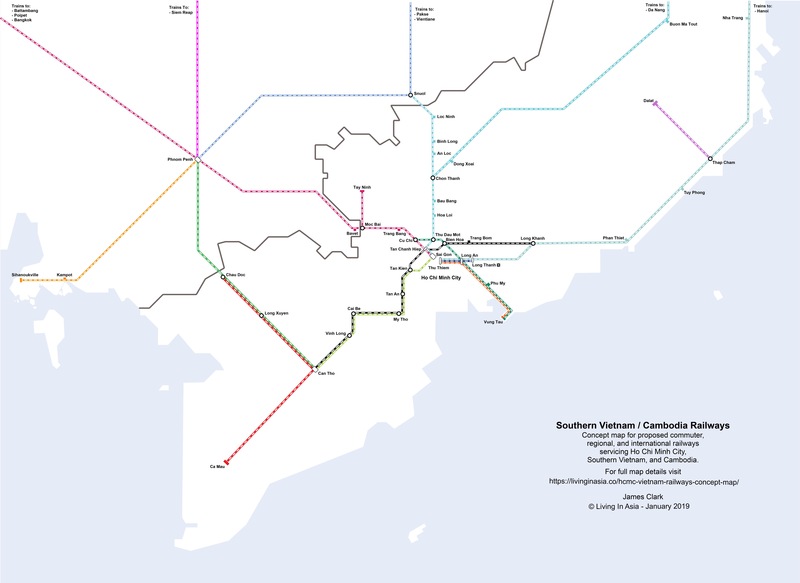 The Mekong Line on my map would be continued all the way to the current Ga Sai Gon, where passengers could then connect to different inner city metro options. This is not a new idea. There was an earlier proposal to run an elevated railway from Ga Sai Gon (alignment shown in the above “Optimised” HCMC MRT Lines map), so I’ve used that as the alignment for this line. 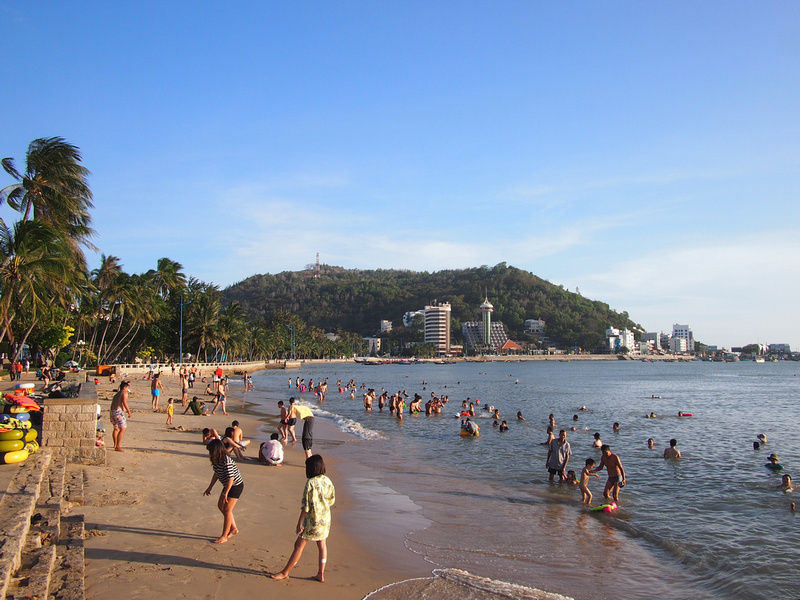 A train from Ho Chi Minh City to Vung Tau is a logical destination, and there has already been a railway proposed with a line running from Bien Hoa to Vung Tau. For this map I’ve drawn what a direct service from Thu Thiem would look like. The 80km journey would be done in about 35 minutes with an intercity train running at 160km/h. Such a service would turn Vung Tau into a real commuter suburb, where workers could work in the city and live by the sea. This would be such a popular service that it would make sense to make a future branch line from Ba Ria to Ho Tram. 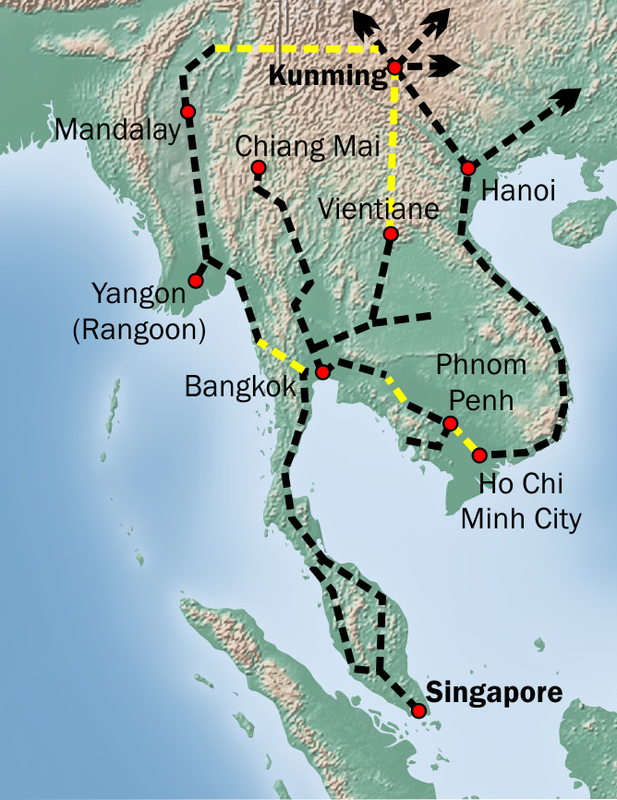 The line from Ho Chi Minh City to Phnom Penh forms one of the missing links of the Kunming–Singapore railway strategy. This is one of the most important lines that needs to be developed, yet there hasn’t been a plan to make a direct route to the inner city. The railway proposed on this map would provide the most direct route to Phnom Penh and eventually Bangkok (thus the Intercity Line). 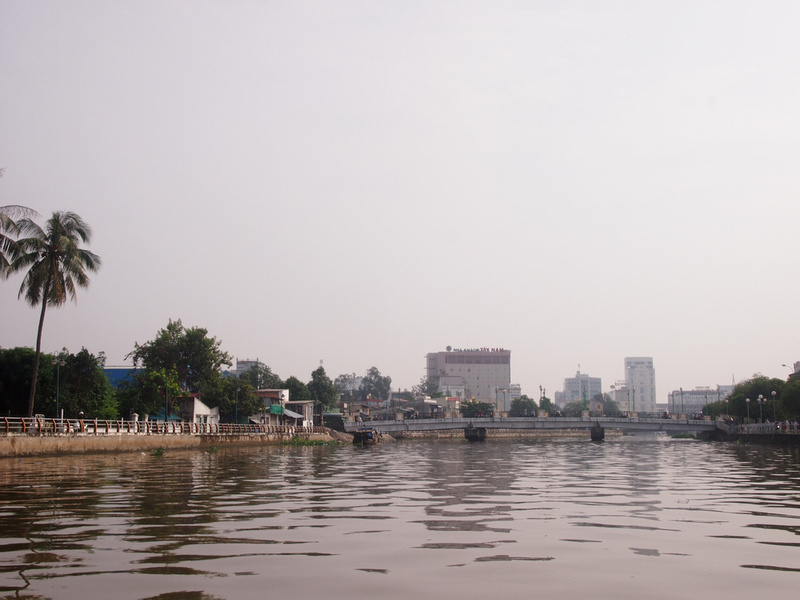 This “long way round” to Phnom Penh gets its roots from the old Di An–Loc Ninh Rubber Line. Even decades after the line closed this route was still considered an option to get to the Cambodian capital. 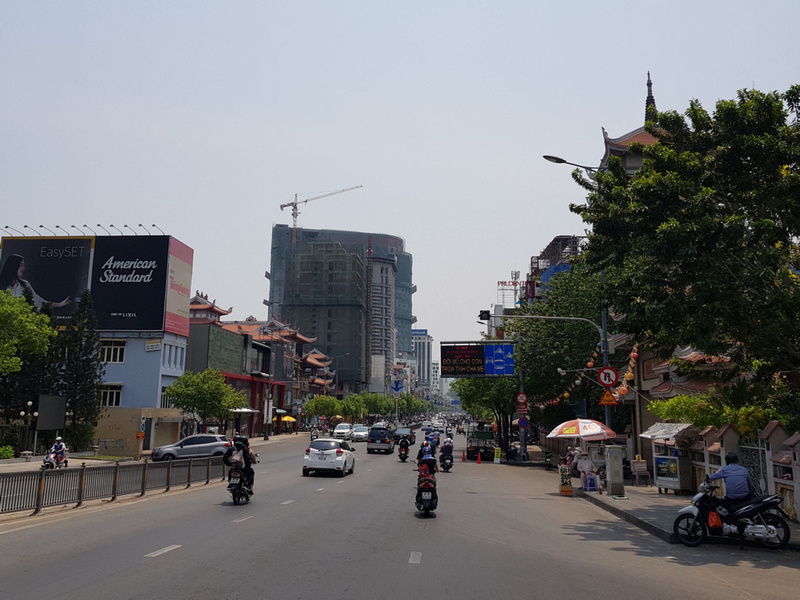 A Chinese firm expressed interest in connecting Can Tho with Ho Chi Minh City and Phnom Penh. 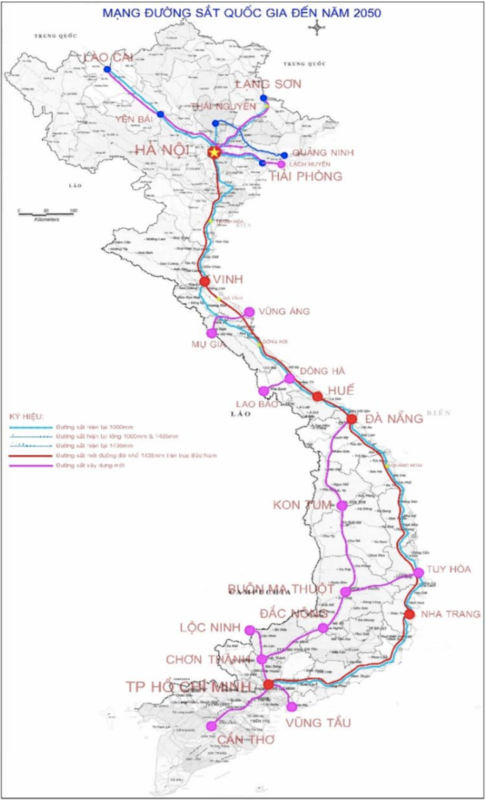 While this is also an indirect route, it would be useful for the Mekong region to be connected by rail to both cities. The third route is the most direct and most logical. This would run from Ho Chi Minh City to the Cambodian border city of Bavet, where it would meet a new Cambodian Railways line to Phnom Penh. If it was built it would most likely terminate at Tan Chanh Hiep Ward in District 12. That’s behind the current airport, miles away from the city centre. 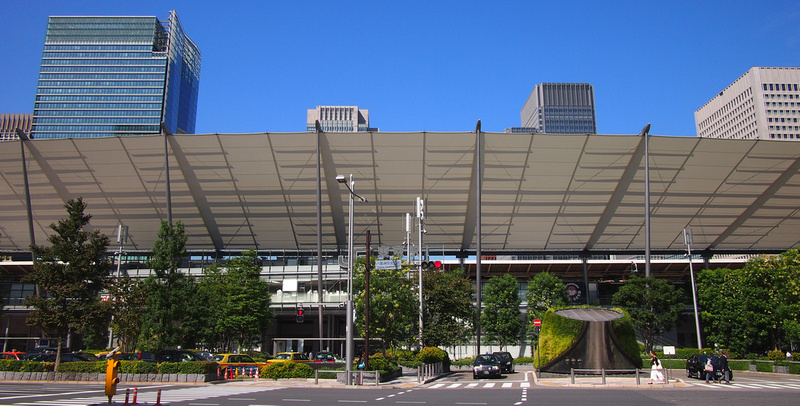 Even though the station would be connected by the metro, it would be an inglorious entrance to the city. An option to getting closer to the city is routing the line from Tan Chanh Hiep along the western bypass line, then down the old line to Ga Sai Gon. That though would be a circuitous entrance into the city, and as we have seen from Line 10, the old railway line to Ga Sai Gon is better off being converted into a monorail line. 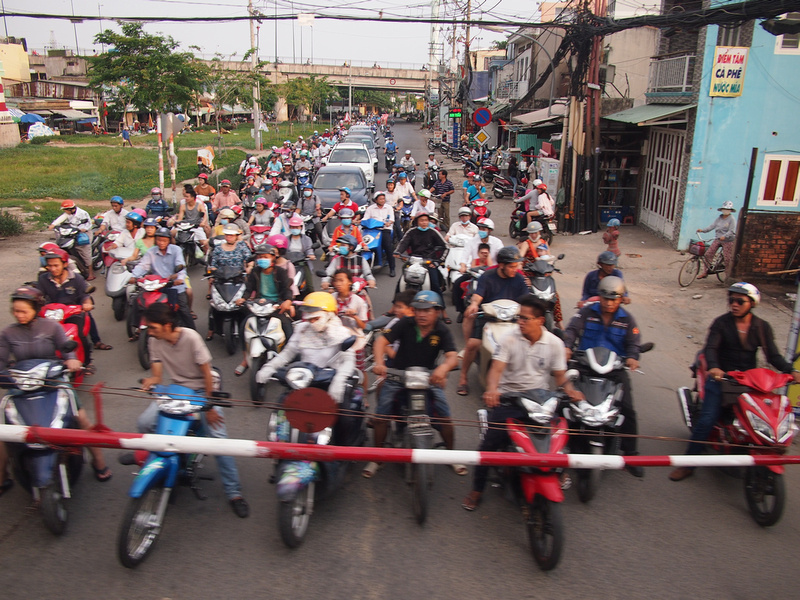 Inner city level crossings are still a thing in Saigon. To make this work there would have to be a new line built from Ga Sai Gon to Tan Chanh Hiep. 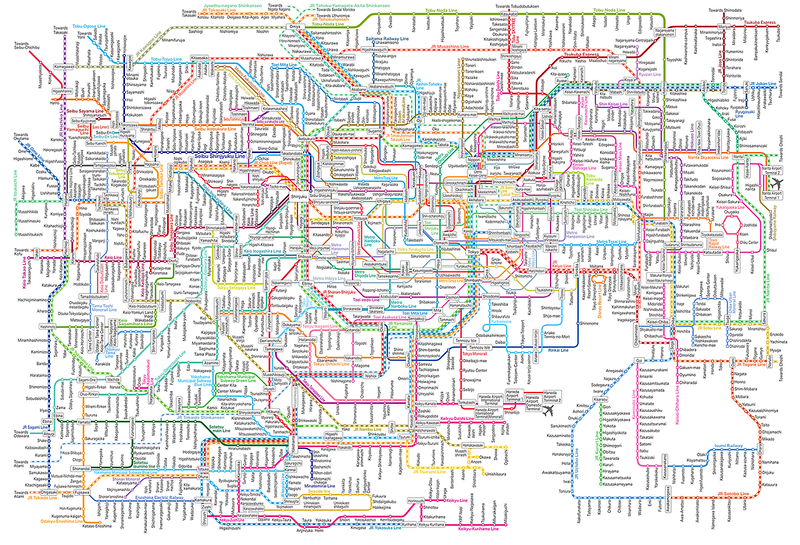 This is complicated by the fact that Line 2 of the metro is already planned underground on this same route. The Line 2 extension to Cu Chi would also take up space where an intercity line might go, and this area is already built up. I haven’t put an exact route on my Google Map as it would require some Haussmann-esque clearance to help make way for the line. It’s no wonder that this has been left in the too hard basket and not proposed at all. In the long term though it would be wise to have a station close to the city centre that receives international trains from Cambodia and eventually Thailand. There was a plan to give the old station a makeover. If it was an international terminal the whole area could be revitalized. In this section I’ve also included a spur line from Moc Bai to Tay Ninh, though this could also work as another line from Cu Chi. 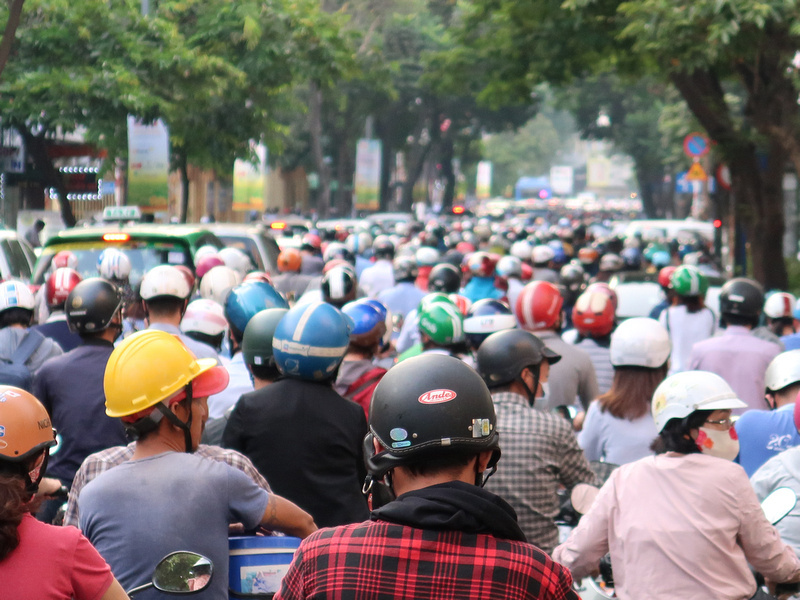 Either way, it would be beneficial to have Tay Ninh included in the Greater Ho Chi Minh City regional transport network. Out of all of the proposed lines this has had the least coverage, yet it would be an amazing project if it went ahead. The first section is the line that goes north through the Southeastern provinces to Loc Ninh and the Cambodia border. This was the first proposed route to Phnom Penh, connecting to Cambodian railways at Snoul. 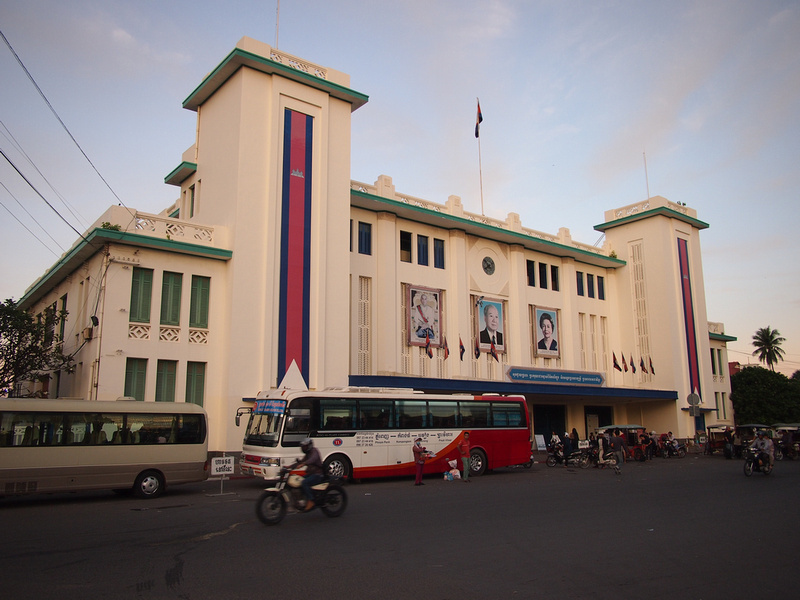 The line would go through Thu Dau Mot, making it a hub railway station and solidifying its ambitions of becoming a satellite city of Greater Ho Chi Minh City. 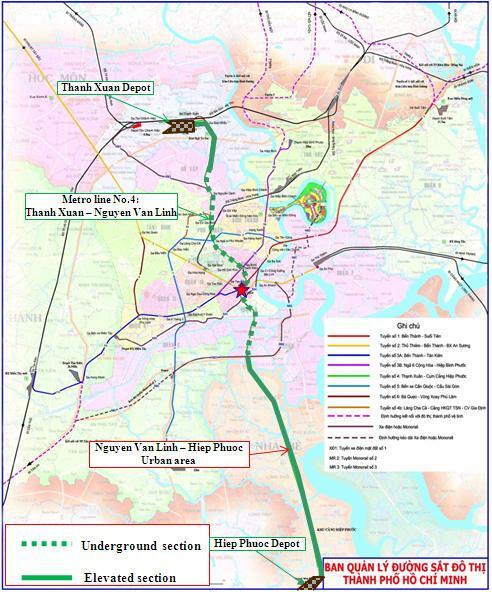 North of Thu Dau Mot, the provinces of Binh Duong and Binh Phuoc would also become potential commuter regions. At Chon Thanh the rail branches to what would be the Central Highlands Railway. This will go to Buon Ma Thuot, DakLak, Kon Tum, and Da Nang, creating an inland route to Da Nang from the south. This line isn’t me wistfully scribbling fantasy lines on a map – it’s been part of a transport masterplan for years. The only thing I’ve changed here is the routing out of Ho Chi Minh City. The Southeast line on other maps have it branching from Di An. I’ve put this line through the Tan Chanh Hiep junction station. The Eastern Ring (as I have christened it) is a composite of different proposed lines that is represented here as a single line. The Bien Hoa to Vung Tau section has been planned as a way of getting freight from the main north-south line to the port of Vung Tau. There was also another report that suggested connecting the port to Cambodia as part of a Trans-Asia railway. 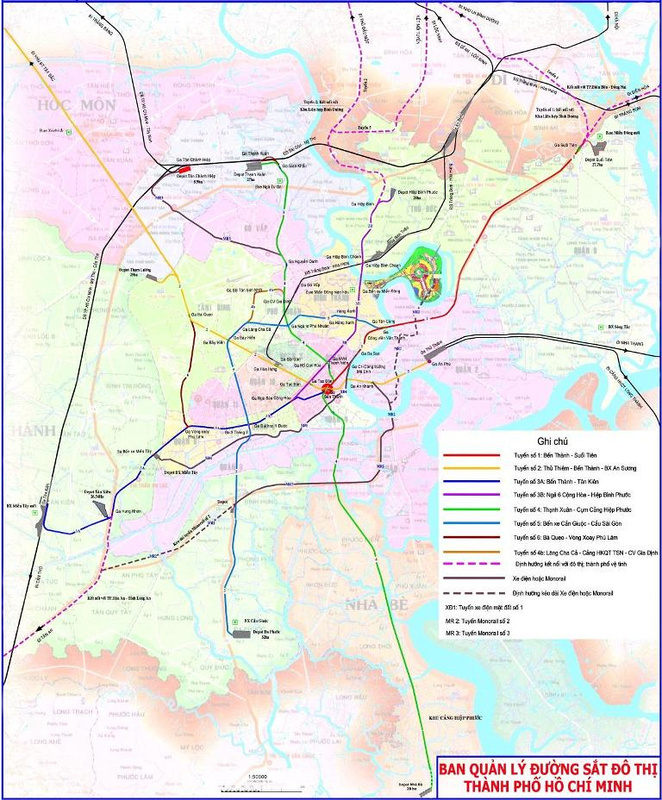 Shown on the map in relation to the other lines, it forms an eastern bypass around Ho Chi Minh City, complementing the western bypass. This would also enable large volumes of traffic to bypass Ho Chi Minh City. The Airport Express is one of my proposals. This is a dedicated airport train that goes from Ben Thanh in District 1 to Long Thanh International Airport. This one might seem like an indulgence, but what’s the point of making a concept map without adding some BHAG’s. The future new airport will be over 40 km away from the city without a fast way to get there. The new airport is going be a hard sell when you consider how quick it is to get from Tan Son Nhat to the city centre. If Long Thanh is going to be a regional mega hub eventually serving 100 million passengers a year, it’s going to need a dedicated airport line. 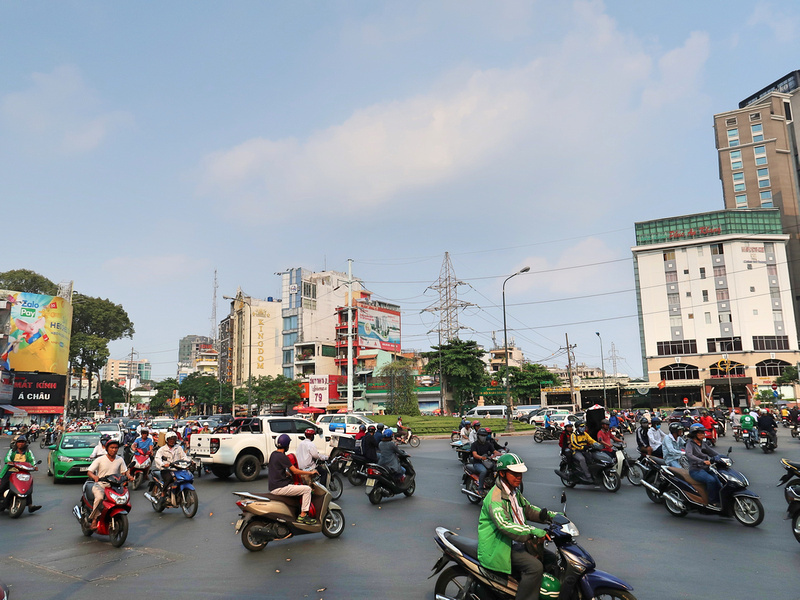 If you’ve ever come back from Vung Tau on a weekend you might have experienced traffic jams on Mai Chi Tho, and this is through the new urban area that is not even close to being finished. The traffic will get worse as the area builds up and the new airport goes into service. There has been a fast train proposed from Thu Thiem to Nha Trang, via Long Thanh Airport. This would still require passengers to change from the train to the metro, or other forms of transport. What I propose an airport express line from Ben Thanh to Ga Thu Thiem, which would then use the mainland line already proposed from Thu Thiem to Long Thanh. From Thu Thiem the airport express line would be elevated down the middle of Mai Chi Tho, over a new bridge across the Saigon River, and down Ham Nghi, terminating near Ben Thanh. This would be an above ground station, next to the old railway administration building. Arriving passengers will get to see the new Thu Thiem Urban Area, with the Lotte city on the right and the Empire city to the left, and the District 1 skyline welcoming you to the city. It would be the grandest entrance to a city in Southeast Asia. 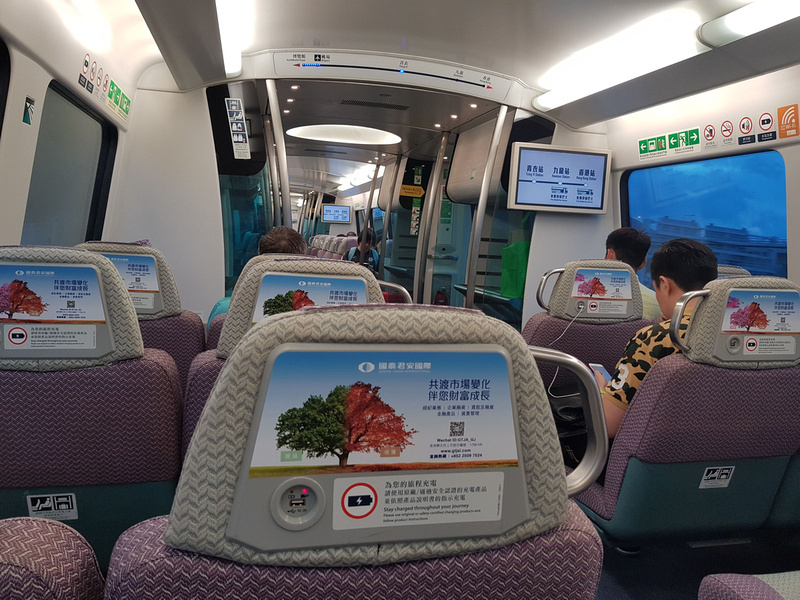 The service I envisage is similar to the Hong Kong Airport Express. This is a great example of an airport line done right. Hong Kong Airport is also about 40km from the city centre, but with the airport train no one ever considers the airport to be too far from the city centre. From HKIA the train stops at Tsing Yi, Kowloon, and Hong Kong Station (in the heart of the financial district). A Long Thanh express would also have three stops: Nhon Trach (for trains to Vung Tau), Ga Thu Thiem, and Ben Thanh. 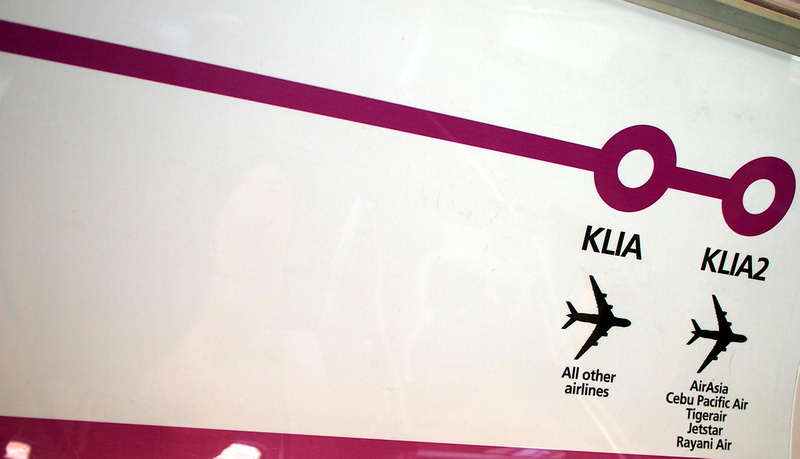 Another example of a good airport line is the KLIA Ekspres. Kuala Lumpur International Airport is even further out at 55km, making it one of the furthest major airports away from the city centre. The airport express gets to KL Sentral station in 28 minutes. The airport express would complement the metro service, giving passengers a choice to opt for speed over price. London Heathrow is a good example of an airport with an express train and metro service. If you really want me to be indulgent (and continue with the Shanghai theme) you could put a Maglev train on this route like the Shanghai Maglev Train. At a speed of up to 430km/h, a maglev train would get you to downtown Saigon in about 15 minutes. 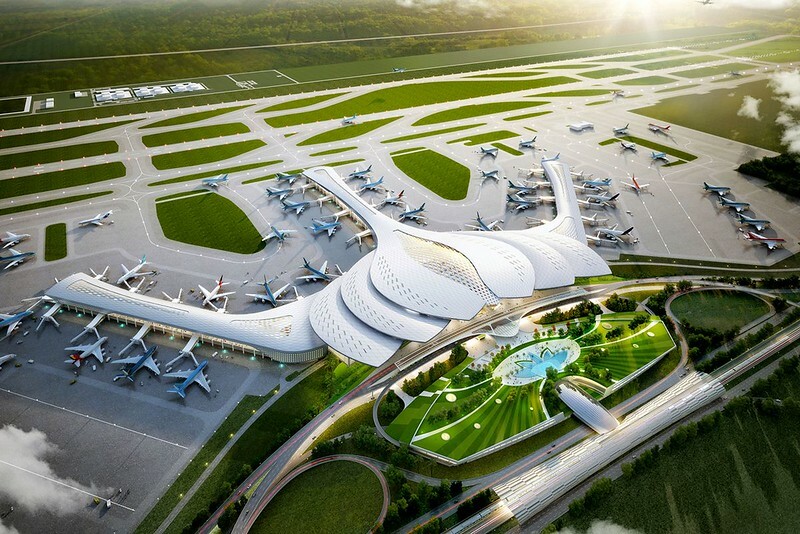 The new airport with a maglev would make Long Thanh a contender to knock Singapore Changi off the top of the “best airport in the world” lists that it continually tops. Conclusion / How realistic is this map? 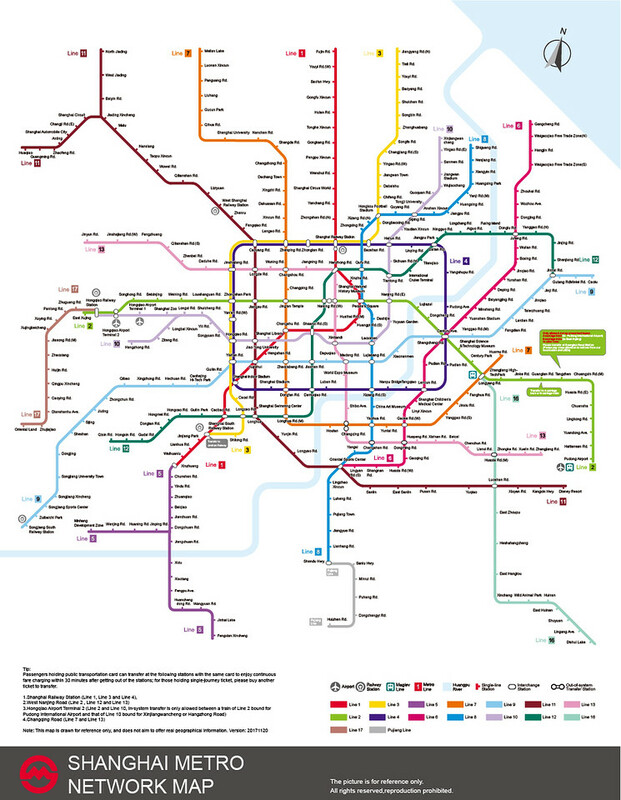 The Shanghai Metro is a good system by which to compare future progress and to aspire to. 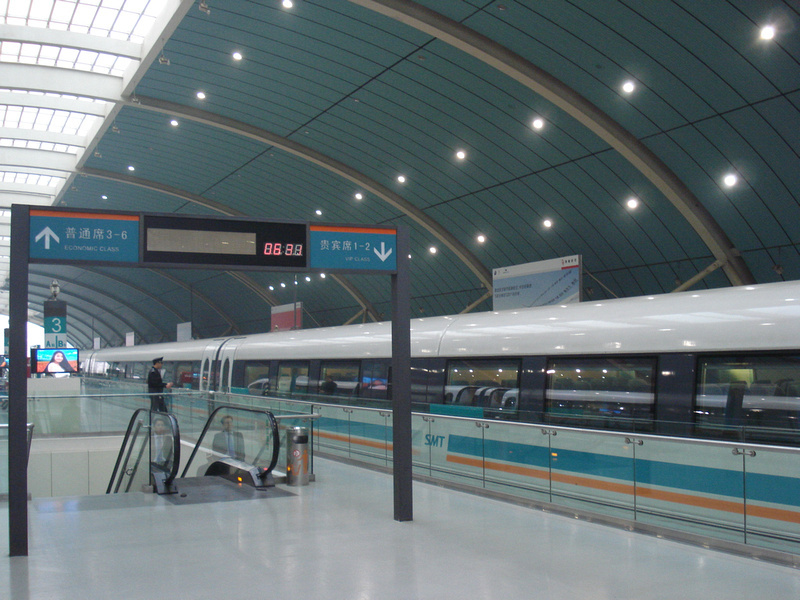 Shanghai began construction of the metro 1986 with the first section opening in 1993. There are now 16 lines and it will expand to 19 by the end of 2020, and up to 25 lines by 2030. Also in 1993 the Pudong New Area became a Special Economic Zone, signalling the beginning of its ascent to becoming the financial centre of China. In a way, Saigon is now where Shanghai was in the 1990’s. 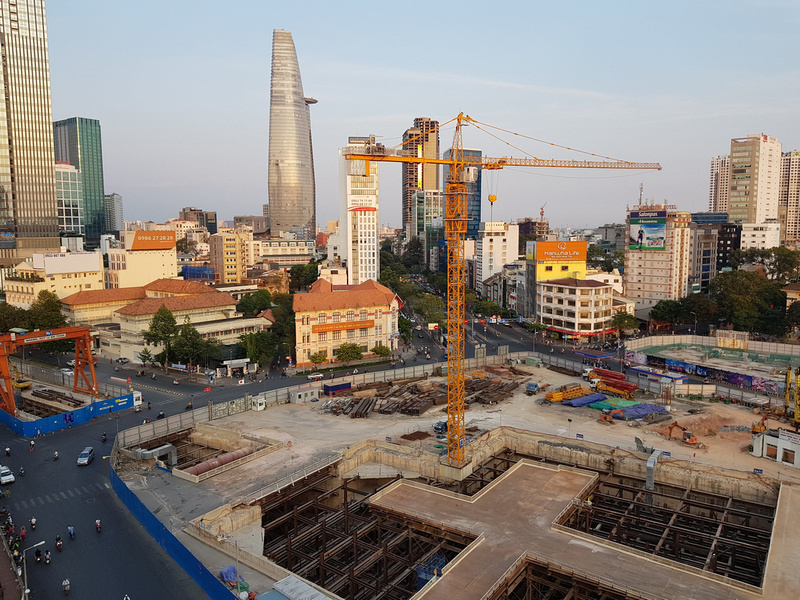 Thu Thiem (the Pudong of Southeast Asia) is just getting started, and HCMC is going through the slow progress that seems to afflict every new metro system around the world. 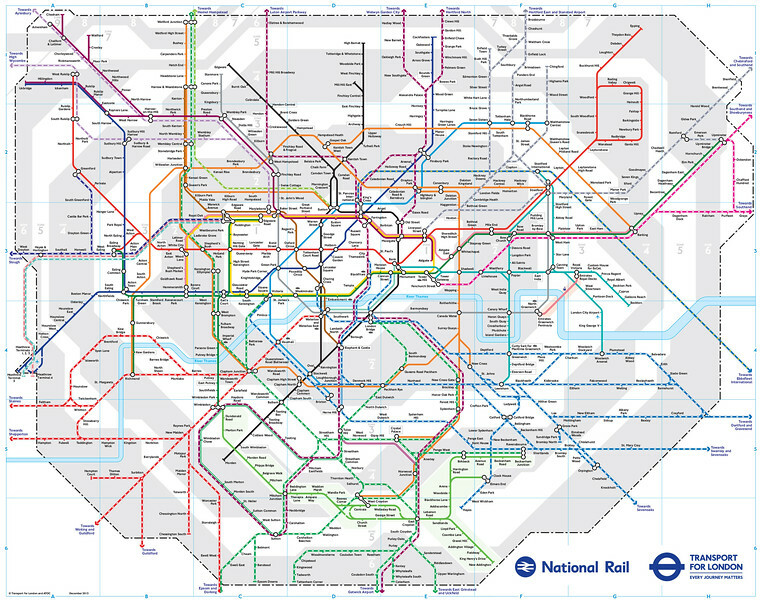 There is an industry of map enthusiasts out there who create interesting fantasy maps of transit systems around the world. Some are so unrealistic that they are indeed purely fantasy. 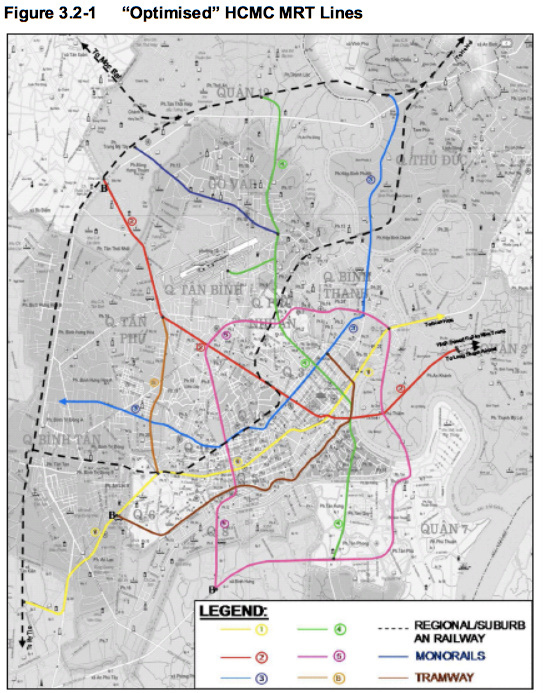 Some though are more grounded in reality, and for this map I like to think that it is more of an outline of what future urban planners will consider when planning beyond the first 9 lines of the Ho Chi Minh City Metro. 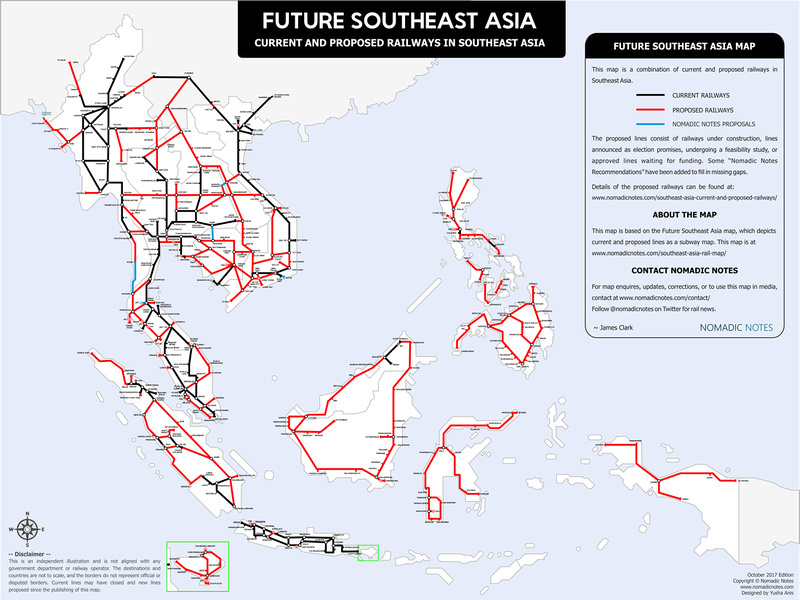 Most of the regional lines on this map were covered during my research of the Future Southeast Asia Rail Map. 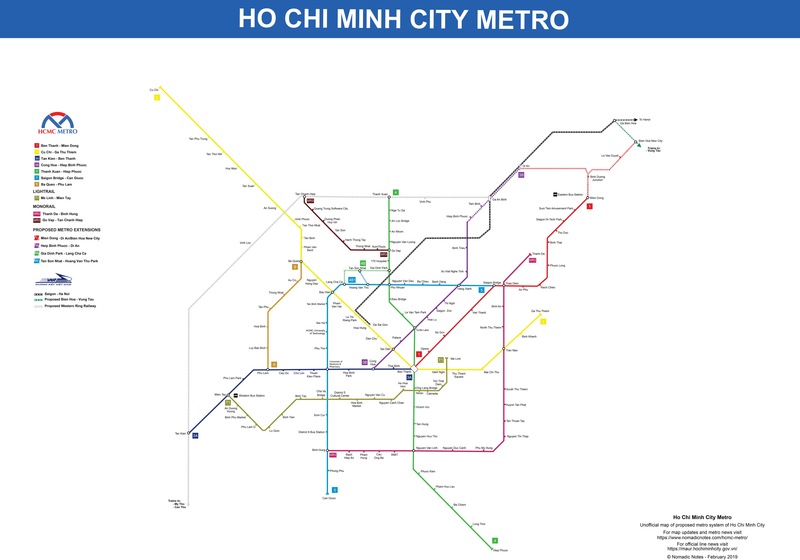 Map of HCMC Metro and regional railways in Greater Ho Chi Minh City area. This previous concept map of the HCMC Metro included proposed BRT lines. This is absolutely amazing! I’m astonished with your understanding of Saigon and where it is heading with this conceptual design as a VNmese myself. Somebody, submit this to MAUR, quick! Thanks! Maybe if everyone submits this to MAUR they will get the message.